Give your resume, social media profiles and job search documents a facelift. Get them upgraded to a contemporary visual format. Include achievement branded language that defines how you did your job better than your fellow job seeker. Ensure you use pivotal keywords throughout your resume and social media profiles to improve your chances of being found by corporate and search firm recruiters. Expand your online presence. Ensure it is professional. Only have 50 connections on LinkedIn? Increase it to 100 quality connections. Not on BranchOut on BeKnown? Try it. Have too many personal pictures and non-professional content on Facebook? Clean it up. By non-professional, I am not talking about picture of you partying indiscreetly during Mardi Gras. Hopefully, at this point, we know not to have those up online by now. I am referring to Facebook posts about beating an illness or time off with the family (posted way too many times) or any content that, while could be neutral or positive in many other respects, can be unlawfully be factored into an employment decision if discovered in an online search of your name. Get out from behind the computer. Meet people. Have you not talked to your former office mates from your previous job in a while? Can you meet some of them for coffee, lunch or a drink? When was the last college alumni cocktail hour you attended? Have you joined a professional networking group that supports your industry or profession? Make new contacts and nurture the relationships you already have to increase your ability to generate leads and information for your job search. Contact companies directly. Don’t just apply through an ad. Don’t even wait for an ad to apply. If you are an accountant looking for a senior accounting role, look for Controllers at target companies where you want to work and introduce yourself directly. Are you a Marketing Executive looking for a new leadership role at a technological upstart? Locate the contact information for the CMO or the CEO and ask for an informational interview. What do you have to lose? And don’t wait for a job to be posted to do this. Just do this. Make social media social. Call or email someone. Or meet them…. I make a point of engaging members, followers and connections from LinkedIn, Facebook and Twitter on a regular basis. I found vendors, clients and referral sources this way. Clients have found me this way. The possibilities that exist with social media access are just mind boggling. Not sure how to start? Pick one person on your list and just pick up the phone or send an email. “Hi ___, we are connected on LinkedIn and I have not chatted with you in a while (or never). Interested in connecting to see how we may be able to help each other? Let me know and we can schedule something or just pick up the phone and call me back…” It can be that simple. Turn off the news. Really. So much of the regular and business news in these turbulent times is just outright negative. Keep your mental health sharp without large and small dosages of negative energy and information found in today’s news. Unless you work at Morgan Stanley, how is learning they are laying off 5,000 people going to help you—especially if you are a pharmaceutical scientist who wants to work with a boutique drug development company? Since it is human nature to gravitate to the dramatic news, even when it is not relevant to our immediate situation, I say just turn off the TV, online stream and email alerts that bring negative news to your attention. Keep yourself positive. Keep your communications positive. In this climate, that will bring you the attention you want. 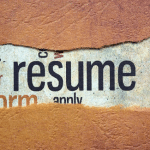 (1) Reach out to me (917-447-1815) or lisa.rangel@chameleonresumes.com) or ask a another trusted individual who hires people and ask how you can improve your resume, social media profiles and cover letters to garner more of the right attention and start to get job search results. (2) Add 10-25% more connections to your LinkedIn Profile—or a minimum of 50, if you need to start there. (3) Call two co-workers from your previous job and say hello…just see what is going on with them. Do not tell them about your job search yet, if it does not come up naturally or seem appropriate. But just making the call will open you up to make more calls of the job search kind. (4) Introduce yourself to a hiring manager at a target company where you want to work and ask for an informational meeting in person or on the phone. (6) Shut off the news. Read something positive and that will make you happy. Go for it. This is a perfect time to reconnect to others and recommit to yourself. Good luck and go for it. Need help with it? Contact me here 917-447-1815 or lisa.rangel@chameleonresumes.com and we will figure out even smaller baby steps for you to get you moving forward…no worries! !